Autumn Rose teaches people to ride horses properly and safely. They are also the official coaches of the 10 time National Champion Ohio State Equestrian team. Autumn Rose has been in business for 33 years. The farm offers riding lessons year round and also summer camps. 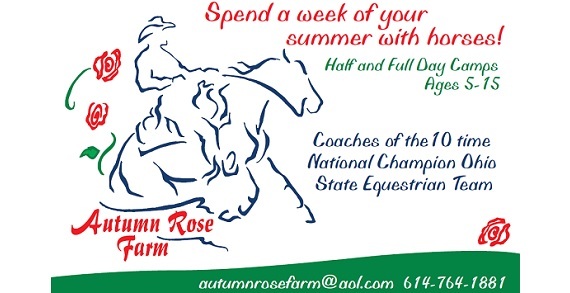 Autumn Rose also offers an IEA team for 6-12 graders who are interested in showing without having to own a horse. They have 30 lesson horses and teach Monday through Sat. Please check the website for more info or call the farm at 614-764-1881. Lessons: Monday-Friday 3-9pm Saturday 8am-4pm. Summer Camp: Monday-Friday, times vary.